Hi darlings! I’m so enthusiastic when it comes to fermented vegetables and foods. They’re easy to make, packed with good bacteria, which help strengthen our guts, and they’re delicious! In order for me to best describe these fermented onions, imagine yourself having an intense taste bud experience bursting with flavor. Have I got your attention? 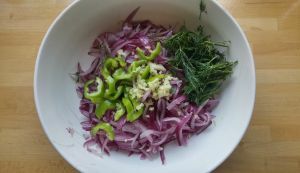 These lacto fermented onions are super healthy for us and because of their crunchy, juicy, radiant color and bursts of flavor, they’re an instant upgrade to any dish. So let your imagination go wild and let’s brighten up our guts. Peel the onions and rinse them off. 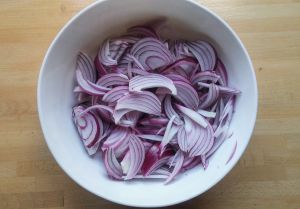 Cut the onions in half and slice each half into thin strips. Add the sea salt, and with two hands grab a few handfuls and begin massaging. The sea salt prevents the bad bacteria from growing in the early stages of fermentation, and allows for the growth of Lactobacilli, the good bacteria. Once consistently massaging for about 5 minutes, you will notice that the onions have taken on a slippery feel, and the natural juices from the onion have been released. Perfect. Chop up the dill, slice the jalapenos and crush the garlic. Now add all of that goodness to the onions and combine. 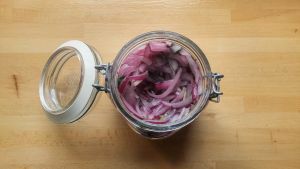 Add a splash of vinegar and fill up a glass jar with the onions, making sure that it has an airlock or a weight, really cramming them in. Insert the cabbage leaf firmly into the jar so that it won’t float later. The leaf is used so that the onions will stay below the brine, the lacto fermentation is an anaerobic process, – no air – where the “bad” bacteria are killed off since they cannot survive without air, and the good bacteria live and multiply. 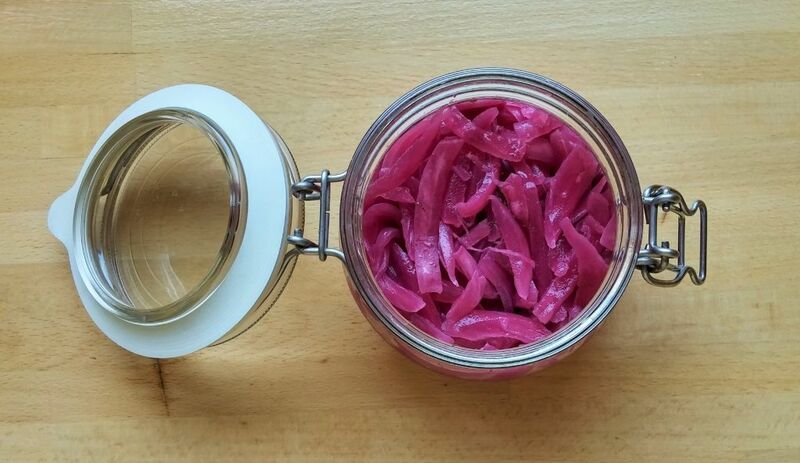 Finally, close the jar and leave at room temperature, away from direct light for 3 – 5 days, then transfer to the fridge. 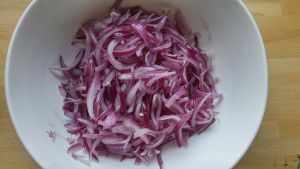 After about a week, your naturally fermented juicy red onions will be ready to devour. So, there you have it, if you loved this recipe, I’m certain you’re going to love these delicious and easy fermented veggies.